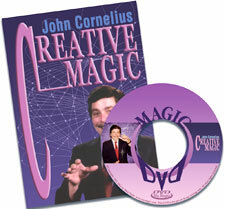 Today, when you order "Creative Magic by John Cornelius", you'll instantly be emailed a Penguin Magic gift certificate. You can spend it on anything you like at Penguin, just like cash. Just complete your order as normal, and within seconds you'll get an email with your gift certificate. Order in the next 11 hours 35 minutes and it will ship TODAY! John Cornelius is one of the most creative inventors in magic. He has won just about every award given for creativity. You will appreciate his genius as he teaches outstanding routines, sleights and ideas for the beginner, expert and everyone in between. Learn effects used to baffle the top minds in magic, as well as material that has earned him magic's most prestigious awards. You will learn magic with cards, coins, cigarettes, balls, flash paper, business cards, ropes, handkerchiefs and much more. You will also learn Flash Paper Productions Techniques, Rubber Cigarette Manipulation, The Fan Steal, The Winter Change, The Silly Locking Penny, Retention Pass, Bluff Matrix, Sly-Tension Vanish, Sponge Bowl, and much more. I have no idea why there are negative reviews for this DVD. I bought this several years ago and have always gone back to it several times. All the material is very strong and extremely practical. The gimmicks are all easy to make without having to buy anything from a magic shop. John is a genius and has come up with brilliant ideas. The bad reviewers are obviously not working professionals to be criticizing this master magic creator. I would highly recommend this DVD to anyone seeking a strong collection of various magic effects with cards, coins and all kinds of ordinary objects. The performances are good. He uses a lot of gaffs, and you could really only use some of his sleights on this DVD. So its good because you could pick up some sleight and ideas and the explanation is good. It's a bad DVD because you really can't do this in routine unless you dedicate you whole performance to this. So it's a take it or leave it type of DVD. So I would just probably get it to boost your creativity in card magic. I see some negative reviews, but I purchased this DVD for a specific effect, marked. One of the live performances referred to the effect, but didn't explain it. The effect is phenomenal! If you don't know it, it is worth learning. I found many great effects on the DVD. The fact that every single effect was something you could make easily from mostly very regular items was very refreshing. In spite of some of the other reviews, I highly recommend this DVD. I will definitively use several of the effects. Sorry John but I didn't like this DVD. There was nothing on here I would actually use and all of the tricks and gimmicks discussed all just seemed very homemade and tacky. The DVD is a bit dated now too.